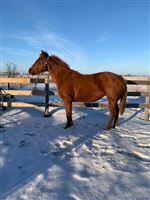 Your gain my loss, This mare is an outstanding mare that has the potential to have some outstanding foals. She was suppose to be my next rodeo horse but had an injury occur to her from right foot. This injury has not slowed this mare down at all, you can see her ripping around in the field with no signs of soreness. So with that being said I think she could be ridden in moderations which my Veterinarian did confirm. Up to date on vaccinations and deworming. Very friendly mare who can be left for months at a time and still remains to be the exact same horse. Ultrasound results of her foot are available on request. She is open for 2019 Breeding Season!